When Motown exhumed this very early Vandellas track for use on the flip of what turned out to be the group’s biggest-selling single, it did them something of a disservice. Not that it’s bad or anything – but as an advertisement, a teaser for any listeners somehow unfamiliar with the girls’ work before the Dancing In The Street radio juggernaut, it’s unfair. Even in 1964, this was already an artefact from the distant past, in a number of ways. Originally recorded by the Vandellas two years previously, with Gloria Jean Williamson on lead vocals (predating Martha Reeves’ promotion to frontwoman), this song had already seen service as a B-side when it appeared credited to ‘the Vells’ back in the autumn of 1962. Back then, it had fit quite well with the putative Motown Sound of the time – a kind of midtempo, bongo-driven, calypso-tinged pop balladry whose most successful exponents were Mary Wells and the Marvelettes. Penned by the then-hot writing team of Holland-Dozier-Gorman (though some sources credit the song to Gorman and Eddie Holland, a mistake according to ASCAP), it was a pretty song, definitely above-average fare, and featuring some superb backing vocals – but Gloria’s voice didn’t really gel with the rest of the record, and the whole thing ended up sounding a bit disjointed as a result. When Gloria left the group shortly after recording the original version of There He Is and Martha Reeves became the full-time leader, someone at Motown decided Martha should overdub her vocals over the top of the old Vells backing track; the resulting song was included on the Vandellas’ début LP, Come And Get These Memories (left), in 1963. 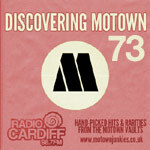 At this point, it could just about hold its own with the likes of the more polished, cohesive title track, which presented a rather different Motown Sound to that featured here. It’s still a difficult song to sing; Martha does her best to put her own take on it, Miss Reeves emulating some of Gloria’s wilder swoops while adding the awesome throaty drive of her best later work, but she still can’t really own the thing and push it right up there. Perhaps I’m unduly influenced by knowing this is a secondhand track, but Martha’s grip on the song never quite seems firm enough, as though it’s frayed from a rope to a thread that’s going to slip through her fingers at any second. And quite what the group’s newfound fans made of this one suddenly resurfacing here, in 1964, a badly-timed throwback issued right in the middle of Motown’s Golden Summer and sent into a million unsuspecting homes, is anyone’s guess. But then, everything I said about the Vells’ version still stands too – the backing vocals from the other Vandellas (here including Martha herself, which takes some getting used to!) still sound fantastic, and the song itself is only that hair’s breadth away from excellence. (The Baby, baby, baby, walk on in! bit in particular was magnificent two years earlier, and it’s still magnificent here.) The track’s been tidied up a little bit from the Vells version, too, with the terrible “knocking” sound effect thankfully removed to the dustbin of history, while everything else sounds just that little bit clearer and sharper. It just still doesn’t quite feel right to me, and while I’m loath to criticise something for a perceived failing I don’t even properly understand, I can’t escape the feeling that the vocal and the track still don’t properly agree with each other, even here at the second time of asking. Still pretty, though. Like the blog? Listen to our radio show! Motown Junkies presents the finest Motown cuts, big hits and hard to find classics. Listen to all past episodes here. Can anyone out there offer an upgrade on that label scan…? Just sent it, Nixon. Check your email. 349×350. Aahh, that’s better. Thank you Dave! I remember noticing as a kid this was a loud record; you could have the volume all the way down and still hear it squeaking from the stylus and know where the song was. Must have been all that brass. Ready or not, I can’t imagine “Jimmy Mack” pressed into service as a b-side even for a sure hit like “Dancing In The Street,” and not knowing what else is in the can, any other hurry-up b-side would have to be an album cut. I thought Martha did a great job on her cover of “Hello Stranger” (on Heat Wave) but it wouldn’t have made income for Jobete, and every dollar probably still counted in ’64. “Mobile Lil The Dancing Witch,” if it was ready, would have been fun too. Motown seems reluctant to admit this is old, because no 45 of it I’ve seen ever credits the Memories album on the label. Mm – the poor-quality scan I had up before you provided a replacement was so lo-res I couldn’t read whether the copyright date said 1962, 1963 or 1964…! Just to clarify, I didn’t mean Motown should have considered “Jimmy Mack” as a B-side, I meant the gulf between that track and this showed how far the Vandellas had come; “Jimmy Mack” is almost contemporary with this single’s release, so it must have been an interesting experience, going from hearing the rushes for that to then suddenly hearing this again. Sadly, we won’t get to talk about “Jimmy Mack” for two and a half years in Motown time, or however long it takes me to get there in Motown Junkies time. I can’t promise on everything Nixon, but I have found good results when I don’t have the record myself either putting the record title or artist name in Google Images, or into eBay and seeing if anybody is selling it and there’s a half decent picture that can be saved. Certainly Gordy 7033 is no rare record even in 2012, but the more obscure the item, the thinner the chances. 🙂 Here comes August: Looking For The Right Guy, Would I Love You, Girl Why You Wanna Make Me Blue… the wonderful summer continues 🙂 To wish myself younger than my 57 today would almost have to mean bartering away my memory of 1964, so I don’t wish it. Even though i’ve that picture cleeve dozens of times, it still bothers me. That girl in the middle looks nothing like Rosalyn Ashford. Is it the wig or different makeup? The picture of the “Memories” lp is an exact repro/re-issue. Check the bottom left-hand corner. There should actually be a Gordy “script” logo at the bottom middle with the catalogue number 903. In the picture on the sleeve, Martha Reeves is on the left, Annette Beard is in the middle, and Rosalind Ashford is standing over them. So Betty Kelly replaced Annette Beard? Yes. Annette Beard left the group around June 18, 1964 (the day before Dancing in the Street was recorded). 228. Little Stevie Wonder: "La La La La La"